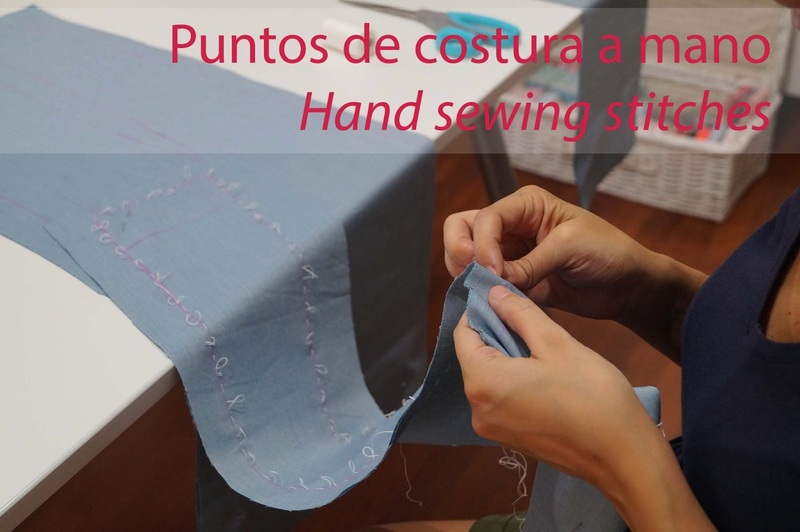 La semana pasada publiqué la primera parte de la guía de puntos básicos de costura a mano; aquí va la segunda parte. 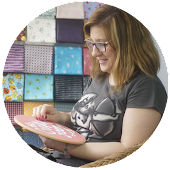 Last week I published the first part of my basic hand sewing stitches guide last week; here you have the second part. Se utiliza para evitar que la tela se deshilache. Se hace mediante puntadas diagonales en el borde crudo de la tela. Las puntadas deben ser de la misma longitud e igualmente espaciadas. Tanto la distancia como la longitud dependen de lo que demande la tela. Overcast stitches are used to prevent the fabric from fraying. It is made by making diagonal stitches over the edge of the fabric. 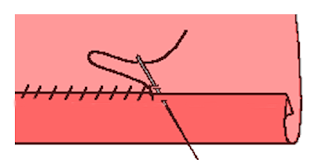 The stitches should be the same length and equally spaced. 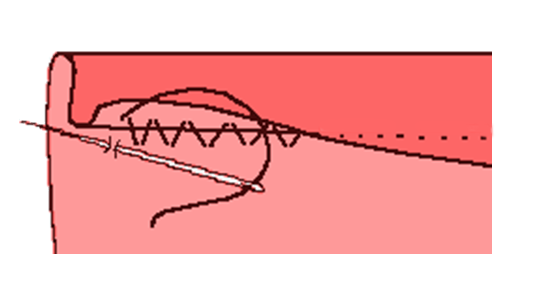 The length of the stitch and how close together you keep the stitches depend on your task. Es el punto que se utiliza en los dobladillos. Se hace un doblez en el borde de la tela y se cose una puntada en él y otra en la tela, cogiendo sólo un hilo, para que no se note por el derecho, y un poco más en el borde del doblez. Las puntadas deben realizarse a unos 5 milímetros de distancia. This stitch is mainly used when hemming any sewing project. It is made by beginning the stitch inside the fabric that is folded down and taking only one thread from the outer fabric. Pass the needle back into the fold and slip it along for 1/2 inch. Es muy parecido al punto de lado pero en este caso se levanta un poco el borde de la tela para que la puntada quede oculta también por el revés de la prenda. Se debe coger un hilo de la tela y un hilo del dobladillo. This is used to draw two sides together invisibly. It´s very similar to hem stitch but in this case raise the hem and insert the needle in between the layers of the material taking only one thread from the top fabric and then one thread from the bottom fabric. Esta puntada se utiliza para coser los dobladillos en telas gruesas. El dobladillo no lleva doblez para que no quede abultado. Las puntadas deben ser pequeñas y no deben apreciarse por el derecho de la tela. Con este punto no hace falta sobrehilar previamente el borde. Catch stitch, also known as the herringbone stitc,h is used to sew hem on thick fabrics. Don’t fold the hem so it does not look bulky. The stitches should be shorts and they must not be seen from the front. Overcast is not necessary. Se trabaja haciendo una puntada diagonal de izquierda a derecha pasando del dobladillo a la tela de abajo, se saca la aguja por la izquierda, formando una X con el hilo y se vuelve al dobladillo haciendo otra puntada de derecha a izquierda. It is worked making a diagonal stitch from left to right across the fold. Then turn the needle to the left and make a small stitch in the fabric from right to left, bring the needle out and up towards the right to the folded fabric (forming an X with the thread). Finally, with the needle still turned to the left, make a small stitch in the fabric from right to left.